I have, by far, the coolest long term test bike on fleet. Forget the BMW S1000RR and Ducati Multistrada, my Victory Hammer S is the most widely admired. How can I claim this? I’ve put it to the ten year-old boy test – the industry standard test for any vehicle’s desirability. Parking it up after a sunny Sunday ride, a couple of local scrotes who had been looking at an R1 and a GSX-R750 beforehand ran across to greet it. "Woooaahhh, wozzat? That’s awwwwwwesome! ", the first proclaimed. "It’s a Victory Hammer, it’s got a 1700cc engine", I told them. The second slack-jawed child replied: "Wow. I bet it’s well fast, it’s way cooler than them," jerking his head at the sportsbikes. The pair then spent ten minutes trying the Hammer for size, taking pictures on their mobile phone, before I had to prise them away and continue on my way. It’s not just 10 year-olds who love it – bikers of all kinds and non bikers are impressed by the Hammer. Non cruiser fans appreciate the huge tyre, muscle car sound and sportsbike-spec brakes and suspension. Cruiser boys appreciate the build quality, the lines of the bodywork and the unusual matt paint – it stands out from the run-of-the-mill Harleys. Non-riders just appreciate the image – it’s big, striking without being too chromed up and showy. It’s all smiles on the riding front – apart from an early glitch with a regulator/rectifier not working quite right and upsetting the fuel injection. It’s been fixed under warranty during the first service by Freedom Motorcycles in March, who turned the bike around quickly and at short notice. The centrepiece of the ride is the engine – it makes nearly 100bhp and 113ft-lbs of torque, so any throttle opening is rewarded with hard acceleration. 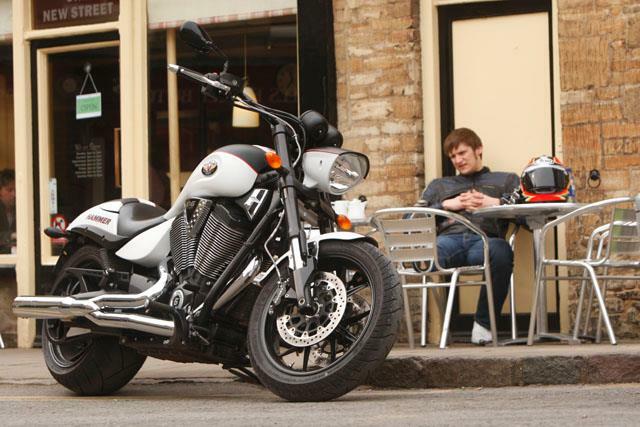 Victory equipped mine with its own 2-1 performance pipe, so you get a hard-edged bellow too. For character you can’t beat it. Crucially, the chassis works too - the Hammer S is a sorted design. Yeah, the pegs grind, but not ludicrously easily. And yes, the front kicks off mid-corner bumps at speed, but a Harley wouldn’t corner that fast anyway. When you want to stop, it does. It’s more than happy to charge along B-roads scaring wildlife from the hedgerows, or chug along in overdrive admiring the world around. Now it’s run in, I can start using it properly. More on my plans for it soon.